Living near a freeway was associated with autism. Results: Adjusting for sociodemographic factors and maternal smoking, maternal residence at the time of delivery was more likely be near a freeway (=309 meters) for cases, as compared to controls (odds ratio (OR), 1.86, 95% confidence interval (CI) 1.04-3.45). Autism was also associated with residential proximity to a freeway during the third trimester (OR, 2.22, CI, 1.16-4.42). After adjustment for socio-economic and demographic characteristics, these associations were unchanged. Living near other major roads at birth was not associated with autism. Rebecca Landa, Ph.D., of Kennedy Krieger Institute, Baltimore, and colleagues randomly assigned 50 toddlers, ages 21-33 months old, who were diagnosed with ASD to one of two six-month interventions: Interpersonal Synchrony (IS) or Non-Interpersonal Synchrony (non-IS). Both interventions incorporated classroom-based activities led by a trained intervention provider, and a home-based component involving parents who received specialized education and in-home training. The interventions were designed to encourage children to make frequent and intentional efforts to engage others in communication or play. The single difference between interventions was that the IS group received more opportunities for joint attention, affect sharing, and socially engaged imitation. The toddlers were assessed at the start and end of the intervention and again six months later. Children in both groups made improvements in social, cognitive and language skills during the six-month intervention period. Children who received IS made greater and more rapid gains than those in the non-IS group. The researchers also noted that children in the IS group used their newly acquired abilities with different people, locations, and type of activity. This is noteworthy because children with ASD have particular difficulty doing so. They tend to use new skills mostly within familiar routines and situations. At the six-month follow-up, children in the IS group showed slower improvements in social communication compared to when they were receiving the intervention, but did not lose skills gained during the intervention period. In contrast, children in the non-IS group showed reduced social communication skills at follow-up compared to their performance during the intervention period. Advancing paternal age and risk of autism: new evidence from apopulation-based study and a meta-analysis of epidemiological studies. Scientists are finding more pieces of the autism puzzle of with the help of MRI scans of brain circuitry, according to a study published Thursday online in the journal Autism Research. By scanning the brain for 10 minutes using magnetic resonance imaging, researchers were able to measure six physical differences of microscopic fibers in the brains of 30 males with confirmed high-functioning autism and 30 males without autism. The images of the brains helped researchers correctly identify those with autism with 94 percent accuracy, says Nicholas Lange, an associate professor of psychiatry at Harvard Medical School and one of the study authors. "No one has measured what we measured," says Lange of the MRI test he and Dr. Janet Lainhart from the University of Utah developed. While previous studies using different types of scans have been able to identify people with autism, Lange says, "no one has looked at it [the brain] the way we have and no one has gotten these type of results." Lange is quick to caution that this type of test is not yet ready for prime time. "We do not want to give anyone false hopes that this is ready for the clinic yet. This method, this test, needs to be tried [and confirmed] with many more subjects outside our laboratory," he says. Plus, the research needs to be expanded to many more study participants and tried on younger people with autism and those who are not as high-functioning as the subjects in this first trial. Description The My Healthy Smile app was developed through a grant from Delta Dental of Minnesota to teach children about good oral health and to ease anxieties around dental visits. This app offers 11 audio & visual social scripts to show children what to expect at the dentist and how to have good oral care at home. Topics include: having your teeth cleaned, taking X-rays and getting fillings, losing a tooth, brushing and healthy eating. “My Healthy Smile” is designed for children between the developmental ages of 3 and 10. The use of social scripts works especially well for children who have autism or developmental disabilities. Created in partnership with dentists, oral health professionals and families. ?e are hearing more and more from families we serve that therapy dogs have had an overall positive effect on their children,?said Marguerite Colston, vice president of constituent relations at the Autism Society, a national grassroots organization. Because each person with autism experiences it differently, there is no certainty a therapy dog will help, she said, but for certain individuals, a dog ?as eased their anxiety and has even helped some to open up to others, as individuals with autism are typically more withdrawn and less likely to socialize.? People who possess a specific change in one of their chromosomes are nearly 14 times more likely to develop an autism spectrum disorder or schizophrenia than those without this change, according to a new study. The change, which is called a deletion, happens when a section of chromosome 17 is missing. The deletion is found only in people who have an autism spectrum disorder, a developmental delay or schizophrenia, said study researcher David H. Ledbetter, a genetics professor at Emory University. "This is just adding one more to that rapidly growing list of genetic mutations" associated with autism that doctors could use to measure autism and schizophrenia risk in children, Ledbetter told MyHealthNewsDaily. Not all people with autism, a developmental delay or schizophrenia have this deletion. But all people who have the chromosome change will develop some form of the disorders, whether it's mild or strong enough for a diagnosis, he said. Wrong Planet is the web community designed for individuals (and parents / professionals of those) with Autism, Asperger's Syndrome, ADHD, PDDs, and other neurological differences. We provide a discussion forum, where members communicate with each other, an article section, with exclusive articles and how-to guides, a blogging feature, and a chatroom for real-time communication with other Aspies. 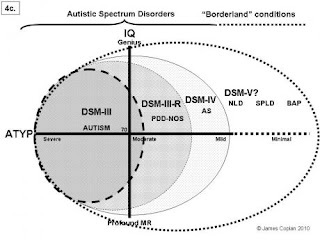 Asperger's Syndrome, a pervasive development disorder, is a form of autism. It’s been three years since Liane Kupferberg Carter lost her father. While time has dimmed the pain, it hasn’t really helped her explain things to her son, Mickey, who misses his grandfather. Mickey is 18 and has autism. She has written often on Motherlode of the distinct challenges of parenting an autistic adult. Talking about death, as she writes in a guest blog today, is one of those challenges. Especially when you really don’t understand it yourself. Thursday is the best day because that is the day Catalina Lopez — cheerful, well trained and all of 17 years old — comes to watch Spencer and Logan, each for an hour, separately, and peace descends on the family’s two-bedroom apartment in western Queens. Competent, reliable baby sitters are closely guarded treasures for most parents; for families who have children with special needs (but who do not qualify for state-supported respite care), such baby sitters may exist only in the realm of fantasy. Those who need a break the most, then, are often the least able to find someone they trust to provide it. Several such parents expressed that sentiment several years back to Joy Levitt, the executive director of the Jewish Community Center in Manhattan. And so, since 2004, the center has been offering, occasionally, a six-week training class for young people interested in caring for children with autism or other developmental disorders. Catalina is one of 34 graduates of the class. The autism-spectrumdisorders encompass a wide range of symptoms, from social awkwardness to a complete inability to interact and communicate. Here, six men and women speak about living with an autism-spectrum disorder. "The prevalence of autism in special education doesn't seem to be the same everywhere, and it doesn't seem to be increasing at the same rate everywhere," he said. "iGo Potty is a free app (hooray!) and it allows you to set a schedule of reminders for when it’s potty time. Potty reminders can be set anywhere from 30 minutes to ten hours apart. The times are set in half hour increments and can be adjusted using a slider. The app is courteous enough to let you set a time span of when you would like your reminders. This means you can eliminate reminders in the middle of the night. When it’s time for a reminder Patty the Potty will appear on the screen with an “It’s Time to Go Potty!” message. Here you (or your child) can tap “Not Now” or “Answer”. If you choose to answer then Patty will put up a screen message that says “Potty in Progress”. Tap the done button and Patty will want to know how your child did. The answer choices are “I went potty!”, “I tried to go!” or “I didn’t go this time”. If your child went to the bathroom they will earn a new virtual sticker. When they’ve earned nine stickers they will unlock a game. The app tracks three rows of nine stickers and you can always wipe the record clean and begin again. The app has a “Progress” screen that will display a bar graph showing how many times your child has successfully used the bathroom. This graph can be emailed out. When your child has finished their training you can use this section to create a diploma with their name on it. In iGo Potty’s settings you can personalize the app with your child’s name and photo. Here you will choose the ringtone you’d like to hear when the app reminds you it’s potty time. Choose from the “I’m a big kid now” song, a flushing noise or my favorite, the slide whistle." Autistic children with severely limited diets may be at risk for vision loss due to vitamin B12 deficiency, according to new research from The Children's Hospital of Philadelphia. Doctors should consider this deficiency when evaluating and treating children with autism and vision loss, the authors said. The Children's Hospital study, which appears in the journal Pediatrics, looked at three boys with autism who exhibited behaviors that indicated vision loss, such as groping for items or bumping into walls. Further evaluation and tests revealed optic nerve damage and low levels of B12. The researchers administered a shot of intramuscular vitamin B12 and visual behavior improved modestly in each case after normal levels were reached. All three patients, ages 6, 7 and 13, ate almost no meat or dairy products, important sources of vitamin B12. "To the best of our knowledge, these are the first three reported cases of vision loss related to a vitamin B12 deficiency related to poor diet in children with autism," said Stacy Pineles, M.D., lead author of the study. She conducted the research as a fellow at Children's Hospital and is now at Ronald Reagan UCLA Medical Center. "Clinicians should have a high index of suspicion for vitamin deficiencies and questions about diet should be part of routine history-taking in this population." There have been many associations between autism and feeding difficulties, with diet-related deficiencies causing such illnesses as rickets, scurvy and dry eyes. With such patients, the researchers said, parents should also be advised to seek evaluation by a pediatric ophthalmologist or neuro-ophthalmologist who can perform a careful examination to rule out optic nerve damage. "Children who refuse foods from animal sources, such as meat and dairy products, are specifically at a higher risk for vitamin B12 deficiency," said Grant T. Liu, M.D., senior author of the study and a neuro-ophthalmologist at Children's Hospital. "In our experience, B12 deficiency optic neuropathy in autism is a recognizable, treatable, and at least partially reversible disorder." Robert Avery, D.O., of Children's Hospital was the third author on the study. "Vitamin B12 Optic Neuropathy in Autism," Pediatrics, published online October, 2010. http://www.pediatrics.org. Federal health officials are cracking down on a controversial therapy that has been promoted as an alternative for a variety of conditions, including autism, Alzheimer's disease and Parkinson's disease. The Food and Drug Administration warned eight companies Thursday that their over-the-counter products used for a procedure known as "chelation" are "unapproved drugs and devices" and so are in "violation of federal law. ""The companies that received the warning letters claim that their products treat a range of diseases by removing toxic metals from the body. Some also claim to treat autism spectrum disorder, cardiovascular diseases, Parkinson's disease, Alzheimer's disease, macular degeneration and other serious conditions," the agency said. "Some companies that received the warning letters also claim their products will detect the presence of heavy metals to justify the need for chelation therapy. "The drugs involved have not been evaluated by the FDA for treatment of these diseases, and therefore violate the Federal Food, Drug and Cosmetic Act, the FDA said. A paper in the Journal of Neuroscience received widespread publicity because it reported a method for diagnosing autism in adults using brain scans, with 90 per cent accuracy. It used pattern recognition methods, training a computer to distinguish between scans of people with and without autism. The resulting test is far cheaper than the usual ones, so it all sounds promising. But ‘90 per cent accuracy’ focuses on the question ‘how often is this test right?’ The vital question is: ‘how often is this test wrong?’ Why? Let’s do the sums. Wyndham’s recently redesigned rooms are a reflection of growing market demands for better services for people with autism, a complex developmental disability that impairs social interaction and communication skills and affects 1 in 150 children. In Texas, Wyndham’s Garden Hotel Austin has five rooms for special needs guests. The rooms feature sounder sleeping security features: Door alarms that notify guests when their suite door has been opened (in case of late-night wandering), corner guards to protect from sharp table edges, outlet covers for electrical sockets, and child-proof door knobs and drawer latches. Also at the Texas property, guests get a bin of toys, a small refrigerator, and a special menu at the hotel’s restaurant. Deemed “Thoughtful rooms” for the hotel’s proximity to and partnership with the nearby nonprofit organization Thoughtful House Center for Children, these five rooms also come with a discounted price tag. Full-term babies who develop jaundice have a 67 percent higher risk of developing autism, Danish researchers say, a finding that contradicts a similar study published five years ago. According to the study published Monday in the journal Pediatrics, being born between October and March and not being the mother's first child further increases the risk for autism for children who develop jaundice. "This paper does not say that jaundice causes autism," cautions Dr. Max Wiznitzer, a neurologist at Rainbow Babies & Children's Hospital in Cleveland, Ohio, who was not involved with the study. He points to a2005 Kaiser Permanente study conducted in Northern California, which also looked at a jaundice-autism link and concluded high bilirubin levels in newborns is not a risk factor for autism. When Ari Ne’eman walked onstage at a college campus in Pennsylvania in June, he looked like a handsome young rabbi presiding over the bar mitzvah of a young Talmudic scholar. In truth, Ne’eman was facilitating a different kind of coming-of-age ceremony. Beckoning a group of teenagers to walk through a gateway symbolizing their transition into adult life, he said, “I welcome you as members of the autistic community.” The setting was an annual gathering called Autreat, organized by an autistic self-help group called Autism Network International. Ne’eman’s deliberate use of the phrase “the autistic community” was more subversive than it sounds. The notion that autistic people — often portrayed in the media as pitiable loners — would not only wear their diagnosis proudly, but want to make common cause with other autistic people, is still a radical one. Imagine a world in which most public discussion of homosexuality was devoted to finding a cure for it, rather than on the need to address the social injustices that prevent gay people from living happier lives. Though the metaphor is far from exact (for example, gay people obviously don’t face the impairments that many autistic people do), that’s the kind of world that autistic people live in. Now, as the first openly autistic White House appointee in history — and one of the youngest at age 22 — Ne’eman is determined to change that. In December, he was nominated by President Obama to the National Council on Disability (NCD), a panel that advises the President and Congress on ways of reforming health care, schools, support services and employment policy to make society more equitable for people with all forms of disability. Picture Exchange Communication System Training PECS is an alternative communication system using pictures for those who are non-verbal and was designed primarily for students with autism. Visit their website at www.pecs.com Where: Veteran's Administration Building Auditorium 210 S. Winchester Miles City, MT When: October 21-22, 2010 Registration at 8:00 AM Presentation from 8:30-4:00. Cost: $100.00 Limit of 45 participants Please contact Karen Pickart, Coordinator CSPD Region I at cspd.r1@gmail.com or call 406-939-3418 or 406-377-6489 to pre-register or to ask questions. A flyer is attached. Study finds autism is associated with higher income and education of parents. The PECS training in Miles City will be on October 21-22, 2010. The cost will be $100 per participant. A new type of brain scan could help doctors identify children whose brains are not developing on schedule, and may eventually explain what goes wrong in the brains of children with autism. The technique, called functional connectivity MRI, shows which parts of the brain are communicating. That makes it more useful for detecting developmental disorders than traditional MRI, which shows brain structures, says Nico Dosenbach of Washington University in St. Louis. The causes of autism are still unclear, but evidence is building that early intervention — before age 1 — may help mitigate or even prevent the developmental disorder from occurring in the first place. Making such early treatment more possible, researchers now report a promising new way of detecting autism in infants as young as 14 months. Neuroscientist Karen Pierce, director of clinical research at the University of San Diego's (UCSD) Autism Center of Excellence, found that autism can be predicted by identifying young babies who have a preference for repetitive geometric patterns. Pierce and her team studied 110 babies — some showed signs of autism spectrum disorders, some exhibited symptoms of other developmental abnormalities, and about half were developing normally. Babies sat on a parent's lap and were presented with two 1-min. videos, played side by side. One video showed children stretching or dancing in a yoga class, while the other showed abstract geometric shapes changing in a repetitive pattern. Among the toddlers aged 14 months to 42 months, 100% of those who spent more than 50% of the time watching the geometric shapes were autistic. Monday, September 20th 12- 1 PM MST Are you looking for ways to maximize your child's learning at school this year?Join Dr. Bridget A. Taylor, Psy.D., BCBA-D, Executive Director of the Alpine Learning Group, a highly regarded education and treatment center for children with autism, and rethink autism's Senior Clinical Advisor, for our upcoming webinar and live chat. Original Animated Shorts Q & A In early 2006, 12-year-old Joshua Littman, who has Asperger’s syndrome, interviewed his mother, Sarah, at StoryCorps. Their one-of-a-kind conversation covered everything from cockroaches to Sarah’s feelings about Joshua as a son. Being the victim of a childhood bully can have a lasting impact, including depression and diminished socioeconomic status, into adulthood. Many adults who were once victims of bullying vividly recall the feelings of intimidation, the sometimes-daily battering of self-esteem. Many also recall the hands-off attitude that used to be common among teachers, principals, and other adults. Fortunately, bullying, which was once considered a normal and unavoidable part of the schoolyard landscape, is now viewed as a much more serious matter. The issue of bullying may be particularly worrisome for parents of children with an autism spectrum disorder (ASD). In this article, we will explore how children with ASD are particularly at risk of becoming victims of bullying. We will also discuss how they may act out in a way that leads to their being identified as bullies. In either case, parents, teachers, and school staff need to know how to help them through the difficulties involved. Click here for rule for full article. Children with autism spectrum disorders are slower at integrating various types of sensory information than those with a more typical development, researchers reported.The finding -- based on recordings of electrical activity in the brain -- is concrete evidence that children with autism spectrum disorders process information differently than typical children, according to Sophie Molholm, PhD, of Albert Einstein College of Medicine in New York City, and colleagues. Why have the numbers of autism diagnoses ballooned in recent decades? Researchers have long claimed that changes to the way the condition is diagnosed are the main cause. But now a series of a studies have shown that diagnostic changes alone cannot account for the increase. They suggest that other causes, perhaps environmental factors, are also contributing to the rise in cases. "These studies give me the feeling that there must be a true increase in the number of children affected," says Tom Insel, director of the National Institute of Mental Health in Rockville, Maryland. The studies are the work of sociologist Peter Bearman at Columbia University in New York and colleagues. They have spent three years trying to disentangle the causes of the roughly sevenfold increase in autism rates seen in many developed nations over the past 20 years. They have identified three factors that are driving up autism rates, but found that these account for only half of the observed increase. Quick brain scan could screen for autism. A 15-minute brain scan could in future be used to test for autism, helping doctors diagnose the complex condition more cheaply and accurately. Interesting article on autism services in Texas schools. The Geek Syndrome - Autism - and its milder cousin Asperger's syndrome- is surging among the children of Silicon Valley. Are math-and-tech genes to blame? In the last 20 years, significant advances have been made in developing methods of behavioral training that help autistic children find ways to communicate. These techniques, however, require prodigious amounts of persistence, time, money, and love. Though more than half a century has passed since Kanner and Asperger first gave a name to autism, there is still no known cause, no miracle drug, and no cure. And now, something dark and unsettling is happening in Silicon Valley. Click here for full article. "Question: why are we giving our nine-year-old a marijuana cookie? Answer: because he can't figure out how to use a bong. Last spring, I wrote about applying for a medical marijuana license for my autistic, allergic 9-year-old son, J., in hopes of soothing his gut pain and anxiety, the roots of the behavioral demons that caused him to lash out at others and himself. After reading studies of how cannabis can ease pain and worry, and in consultation with his doctor, we decided to give it a try." A three-part essay from Slate magazine. Pharmacies are halting sales of OSR#1, a compound marketed as a dietary supplement to parents of children with autism, six weeks after the U.S. Food and Drug Administration called the product an unapproved new drug. Several pharmacists told the Tribune they received an e-mail last week from Boyd Haley, president of the company that makes the product, informing them that OSR#1 would not be available after Thursday. One online pharmacy, Forrest Health, posted this message: "CTI Science has voluntarily agreed to remove OSR#1® from the market effective Thursday, 29 July 2010." One of the recurring themes heard in online discussions of autism is “where are the autistic adults?” Click here for full article. Is Picky Eating An Early Sign Of Autism? In addition, say experts, the new study suggests that feeding problems may be considered an early sign of autism. Most cases of ASD are diagnosed after age 2 or 3, when symptoms such as an inability to verbalize or a lack of development of language and social skills emerge. But Emmett and her team say changes in feeding patterns, which can materialize as early as several months after birth, could signal the presence of early autism. Analyzing a child's voice may someday be a way to screen children for autism, according to a new study. "What the study does is apply a technology that is capable of identifying sound differences in children's speech," says Steve Warren, a behavioral psychologist at the University of Kansas and one of the study's authors. If we don't remember me. This intense two-day training is designed to teach participants to appropriately implement the Picture Exchange Communication System. It begins with an overview of the Pyramid Approach to Education to explore the key components of designing effective educational environments. A historical overview of language training programs used with non-verbal individuals is discussed along with how to set the stage for an abundance of communication opportunities. Participants will learn how to implement the six Phases of PECS, including attributes, through presenter demonstrations, video examples and role-play opportunities. Participants will leave the workshop with a basic understanding of how to implement PECS with individuals with autism, related developmental disabilities, and/or limited communication skills. .Click here for full article. One of the hardest things about parenting older kids who are on the autism spectrum is recognizing that the issues they're dealing with as teens are very different from the ones they dealt with in elementary school. It's so much easier -- and more comfortable -- for us to think about birthday parties and playground friendships than it is to tackle the prom and dating, isn't it? "Suddenly, the question is not simply, 'How do I teach my child this or that?' but a much more complicated 'How do I teach my child not to need me to teach him anymore?'" writes Claire Scovell LaZebnik in Growing Up on the Spectrum: A Guide to Life, Love, and Learning for Teens and Young Adults with Autism and Asperger's. Billings July 21-22, 2010 8:00 am - 5:00 pm both days Please join us for a 2 day conference on the MSUB Campus to continue our work for Montana children with Autism. This conference is for everyone who loves and works with autistic children every day. This year’s conference will start with a one day workshop by Dr. Tony Attwood, internationally renowned expert on Aspergers Syndrome. Dr. Attwood is traveling to Montana from Austrailia to share his extensive knowledge. The second day of the conference will include a parent panel and breakout sessions designed specifically for four tracks: Autism 101, Parents, Educators & Practitioners. We will focus on Circle of Friends, inclusion and socialization in schools. Whichever side is right, that moment between Dr. Shames and the mothers who don’t have their children vaccinated reveals that beneath the heated do-they-or-don’t-they words about vaccines themselves, there’s a more delicate question that no scientific study can answer. It involves whether parents’ rights to make choices about their children trump the needs of the community. This is a 1969 journal article. It is disturbing to see what was once considered science.